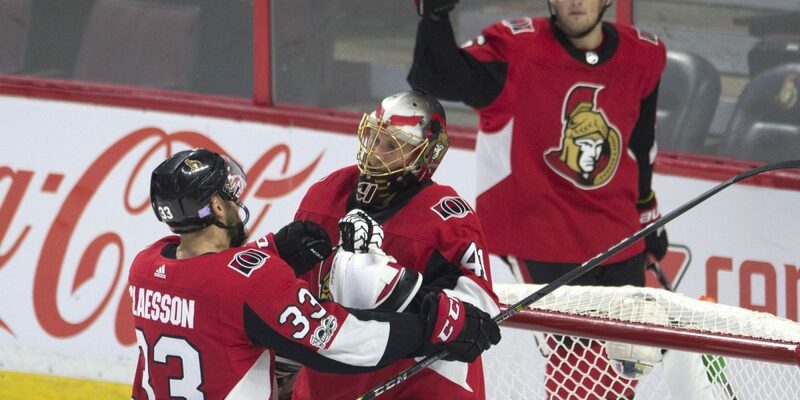 OTTAWA — Mark Stone had a goal and an assist, and Craig Anderson made 24 saves to help the Ottawa Senators defeat the Detroit Red Wings 3-1 at Canadian Tire Centre on Thursday. Alexandre Burrows and Nate Thompson also scored for the Senators (6-2-5), who had lost two straight games. Anthony Mantha scored, and Jimmy Howard made 27 saves for the Red Wings (6-7-1), who had won two straight. “It’s a huge win,” said Stone, whose goal was his 200th NHL point. “This team (the Red Wings) came out to a really hot start and kind of tailed off a bit. They’re trying to chase us down, so it was a big win, especially in regulation. Mantha made it 2-1 with 3:23 left in the third period with the Red Wings on the power play and Howard on the bench for an extra attacker. Mantha, standing in the slot, deflected a shot by defenseman Mike Green. Thompson scored into an empty net at 19:50 to make it 3-1. Stone’s goal with 54.8 seconds left in the first period made it 1-0. He found a loose puck in a crowd in the slot and shot it by a screened Howard for his Senators-leading eighth goal of the season. Stone set up Burrows for his second goal of the season at 11:25 of the second period on the power play. Burrows scored on a shot from the slot to Howard’s stick side. The win was the third at home for the Senators in nine games (3-2-4). The Red Wings said the Senators executed well on defense and reduced the effectiveness of Detroit’s speed. Mantha’s power-play goal at 16:37 of the third period. Anderson’s save on Luke Glendening’s shot from the slot at 4:20 of the third period. Burrows’ power-play goal at 11:25 of the second period. A goal by Senators defenseman Cody Ceci was overturned on video review at 3:27 of the first period. It was ruled forward Zack Smith interfered with Howard before the puck crossed the goal line. … Ottawa forward Kyle Turris returned to the lineup after missing three games with a viral infection. Red Wings: At the Edmonton Oilers on Sunday (4 p.m. ET; SNW, FS-D, NHL.TV). Senators: Host the Vegas Golden Knights on Saturday (2 p.m. ET; TVA Sports 2, TSN5, ATTSN-RM, NHL.TV).